The rough and tough Asper-Gavere course is a cyclocross Classic and it's also the fourth round of the Superprestige series on Sunday (November 16th). 'Mister Superprestige' Sven Nys has yet to win a round so could Sunday be the day that looks to impose himself in his attempt to win an amazing 14th series title? We also take a look at the other events around the world this weekend. THE first three rounds of the 33 rd Superprestige series have produced three different winners and so competition for the season-long award is still fierce with only seven points separating the top six riders: Mathieu van der Poel (40), Sven Nys (39), Lars van der Haar (38), Kevin Pauwels (34), Klaas Vantornout (34) and Tom Meeusen (33). Sunday’s action moves to the famously tough Asper-Gavere circuit on a wooded hillside around the impressive Belgian Army base of Kasteel Grenier which sits high above the Schelde river. With rain currently falling across Belgium, Sven Nys will be looking forward to the technical parcours the most especially after his convincing win in Niel on Tuesday. So, can anyone stop Belgian champion Nys marching onwards towards his fourteenth Superprestige title? UPDATE: Elite men's result (Report and photos to follow): 1 Klaas Vantornout; 2 Pauwels; 3 Nys; 4 Meeusen; 5 Van der Haar; 6 Van der Poel; 7 Walsleben; 8 Wellens; 9 Sven Vanthourenhout; 10 Bart Aernouts. Start times (all CET): Nieuwelingen 10u00 (CET); Ridley Superprestige Juniors 11u15; Elite women 12u30; Topsport Vlaanderen Superprestige Under-23s 14u00; Hansgrohe Superprestige Elite men 15u30. 2013 results: Elite men: 1 Nys; 2 Walsleben; 3 Klaas Vantornout; 4 Peeters; 5 Albert. Elitewomen: 1 Cant; 2 Wyman; 3 Harris. Under-23 men: 1 Van Aert. USA: The Jingle ‘Cross Rock weekend is here! In America, it’s the eleventh edition of the three-day Jingle ‘Cross weekend in Iowa City with C2-ranked races on Friday evening and Sunday either side of a C1-ranked race on Saturday afternoon. The Christmas-themed (yes, it’s coming) event, famed for it's tough and hilly parcours, boasts possibly the largest overall prize payout outside of a UCI World Cup event. 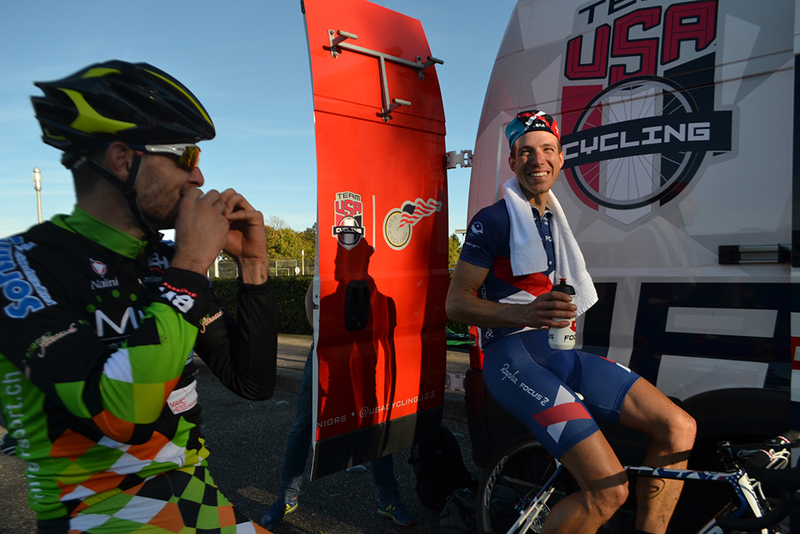 Belgian-born Ben Berden won Friday evening's race - his first UCI win of the season. American champion Jeremy Powers (below) will be one of the favourites and will be looking to score his tenth UCI win of the season. There is more on this big US event including Behind the Barriers TV’s 2013 coverage of the racing here. Did you know that top Swedish road racer Emma Johansson, who topped the UCI road rankings in 2013, is also the Swedish cyclocross champion and today (Saturday) Sweden holds it’s national championships? Sadly however, we understood that Johansson will not defend her title - choosing to attend a mountain bike ride for sponsor Shimano instead. Calle Friberg is the defending Swedish men’s champion. UPDATE: The new Swedish 'cross champions are Fredrik Edin (after defending champion Calle Friberg sadly had a mechanical far away from the pits) and in the women's race 16-year-old Ida Jansson (thanks to Robin Hedstrom). There are also UCI-ranked races in the Czech Republic (Toi Toi Cup), France (Coupe de France), Switzerland and Great Britain - the third round of the UK National Trophy in Durham - this weekend. There is an unusual cyclocross race taking place in Yorkshire, England today (November 15th) where 'cross riders are pitted against runners. The event near Bingley was first held in 1927 and we've a fascinating article about the race and others of this kind of here.